Want a truly unusual flower? Look no further than Bat Flower. Give it some space to spread its wings. 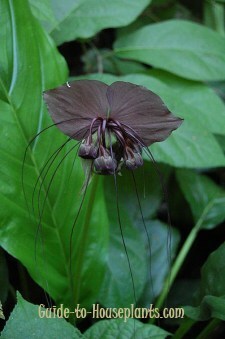 Those dark, exotic flowers grow up to 12 inches (30 cm) across, and feature "whiskers" that reach 24 inches (60 cm) long. You can expect flowers when your plant gets enough sunlight, typically in late spring through summer. Blooms may be black, brown or purplish. Its lush, lance-shaped leaves can reach 2 ft long or more. This is a plant that needs plenty of room. An unusual tropical flower in the Dioscoreaceae family, this ornamental belongs to a diverse group, including yams. 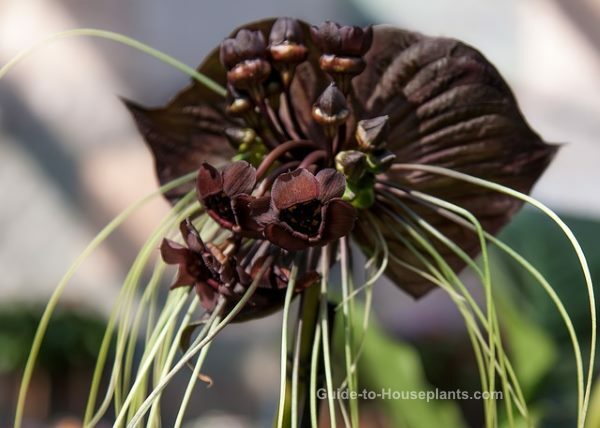 Tacca chantrieri is rare, but sometimes available from online nurseries. A white variety (Tacca integrifolia) of this plant exists, but my sources tell me that White Bat Flower is not as easy to grow indoors. Native to the rainforest in Yunnan Province, China, this tropical perennial is suited to average indoor temperatures. However, it doesn't like dry air at all, which can make it difficult to please in many homes. Give your plant the humidity it craves. If the relative humidity drops below 50%, use a pebble tray or room humidifier to increase the moisture in the air. Grouping plants also helps to maintain the humidity around them. In early spring, repot rhizomes in fresh potting mix. 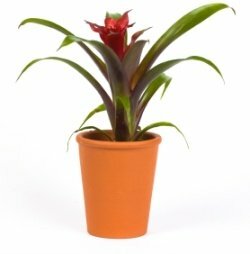 Unlike many flowering plants, this one doesn't like to be crowded so give it some space. This is a good time to divide rhizomes and pot them separately. 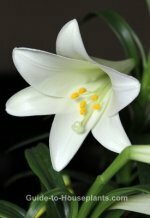 Light: These tropical flowers need bright light to bloom, but keep them out of direct sunlight. Water: Keep the soil lightly moist at all times. Use a pot with a drainage hole to prevent soggy soil, which will cause the rhizomes to rot. Humidity: Moderate to high, preferably 50-70% relative humidity. Use a room humidifier or pebble tray to increase the moisture in the air. Do not mist this plant. Temperature: Steady temps of 65-70°F/18-21°C year-round. Soil: Neutral to acidic potting mix, which is peat-moss based. I'd mix in a couple handfuls of perlite to help drainage. African violet potting mix is ideal. Fertilizer: Feed every 2 weeks with a 10-20-10 liquid fertilizer diluted by half while plant is growing and flowering. Do not feed in winter. Propagation: Divide rhizomes in spring and plant one piece per pot. You can allow the seed pods to dry on the plant; propagate them by planting seeds in moist potting mix.